While this blog “showdown of LED lights” is intended only for those that came out in 2012, it has the implication that these are the best, which simply is not true when looked at scientifically and as per warranties. An example here would be the TMC 1000 Ultra which is a few years old, but has the newest patented Cree XR-E emitters AS OF 2012. Using the implied logic in this Reefbuilders blog, a Ford F150 that has been around for years, but has a new engine is somehow inferior to a new model truck from company XYZ. Gee, I thought a 2013 Ford F-150 was different from a 1970 F-150 model, but if I used the implied logic from the “LED Showdown”, I guess I am wrong??!! Also missing were the 2012 AquaRay Mini 400 & 500s. While these are not the top of the line LED, rather more than a niche LED, these are still vastly superior to the Finnex with its Chinese made Epistar emitter. Sadly the Finnex made this list while the AquaRay did not. As well the excellent TMC AquaRay Fiji Blue 600 also released in 2012 was also snubbed, hmmmm. Interesting too as per the TMC AquaRay snub, AquaRay has released the new & incredible Ocean Blue ND Ultima; Review and 600 Ultima; Review in December of 2012, so this competition is skewed here as well. One might argue that these lights will not be available to most until January or February for most of the buying public, but this is splitting hairs. Reef Builders is showing their ‘true colors’ with this inaccurate review of the AquaBeam NP 1500 Ultima. In this review they get some very basic facts wrong. I suggest looking at these two posts from this website, the first factually looks at warranties and the second looks at the facts of PWM versus Current Reduction Drivers, with the vast majority of over rated LEDs utilizing “current reduction”, including most featured in this ridiculous Reef Builders Poll. 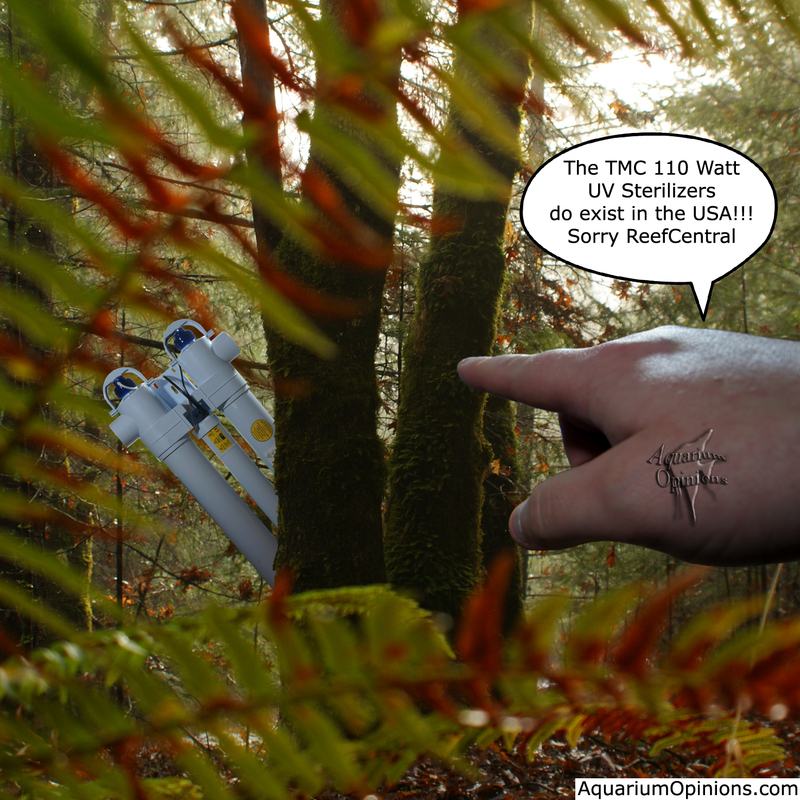 One in particular caught my attention in that he [Bryopsis] called out the lack of knowledge of PUR and the so-called lack of popularity of the TMC line of LEDs in the USA, when in much more seasoned European aquarium keeping circles they are well known. The facts are, as also pointed out, that TMC does no spend $$ marketing like EcoTech and others do in the USA, more on simply developing a better product with a warranty 2-3 times longer than all others. “They’re a household name in Europe. As far as I know, there’s only 1 distributor here in the states. I should point out that there are some good LEDs in their “showdown”, but limiting this “competition” to just 2012 LED releases based on hobbyist preferences and snubbing one of the top notch LED brands used by many professionals makes for a VERY skewed competition. In another ReefBuilders thread, a person commenting hit the nail on the head about how this website along with Reef Central are NOT places for those desiring scientific reasoning should visit. You mean the purchased badge? Just like Ecotec purchased out reef central? Anyone dare say anything against ecotec and they get the ban hammer faster then the black plague.. Its too bad everyone else in this showdown didn’t get a chance to mass span everyone begging for a vote. This person has exactly summed up my experience along with others. Even EcoTech’s own emails ask those inquiring questions to go to this forum. WHY; because they have bought and paid for this forum. How otherwise intelligent persons can recommend a LED fixture that utilizes “cool white” emitters and uses “current reduction” instead of the vastly superior “pulse width modulation” to control their LEDs screams out that this forum is bought and paid for!!!! If you disagree, you WILL get attacked at the very least with straw man arguments that attack the person, NOT the facts. What is interesting is the comment I quoted from Reef Builders about the Reef Central “Ban Hammer” was scrubbed clean as well as all other comments! You think they made too good a point and hit a raw nerve with the Reef Central LED Police???? Gee, what about PUR? The SIMPLE FACTS of lost energy as heat instead of light? The use of PROVEN useless green emitters? Lack of PWM by EcoTech????? TMC simply has not bought their way into forums such as Reef Central here in the USA. Even some simple investigation will show that EcoTech is a late comer to the high end LED market, not TMC (which is very popular in Europe, certainly not a small player). As well science is NOT a popularity contest, sure if you want to be lemmings and follow these buffoons at Reef Central over the cliff go right ahead. Reef Central continues to show itself as a dishonest, heavy handed forum, where SIMPLE scientific facts are thrown out the window in lieu of personal Ad hominem attacks. They cannot even get simple facts straight of which LEDs were available on the market first. In fact I remember when the EcoTech did come out, and I was discussing this light with others at an LA marine livesotck dealer, the others thought the EcoTech would not get very far because it lacked essential lighting elements and was much more gimmicky than the already well established premier TMC Aquaray lights. Admittedly we were wrong here, as we did not anticipate how well Reef Central would be able to pour the Kool Aid down the throats of so many gullible persons who read their awful forum, then cut and paste into other gullible forums such as PNWMAS! –Why Aquaray LED Light Fixtures, Review? This is one of my posts outlining the facts that separate the Aquray lights I have come to support and all others. 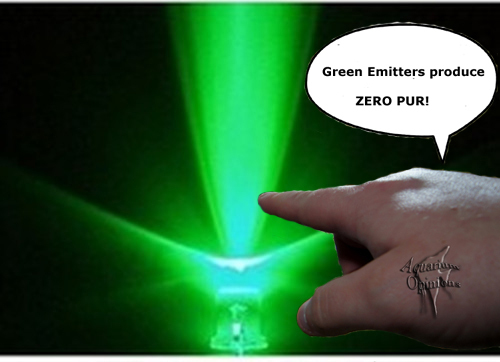 The above link has an excellent graph that plots the PUR of actual emitter used by the EcoTech. If this does not convince any reader why the EcoTech is far from the best LED, I have some beach front property to sell you in Barrow Alaska! Professor Walter of St. Mary’s College of Maryland University LED Study. Make sure to look over the chart near the end of the article! The bottom line, while this “showdown” might be entertaining to read; realize this is simply a good read while enjoying some good cannabis and nothing more. I will start this review of these two popular LED Aquarium Lights in a different way from my other reviews. The reason is while these are nice, feature rich LED fixtures that produce good results, these are NOT the best and the scientific evidence is easy to find if you simply dig deeper than an aquarium forum or Google search. This IS well known in the industry science based information to back this statement up. Yet, I was made aware by a couple of clients of personal attacks in forums against the authors of blogs/websites that bring up these points/evidence rather than deal with known facts or simple professional experience. While admittedly my experience and that of my friends in the professional aquarium service business who use many different LED Fixtures is anecdotal, this still counts along with known FACTS about current LED Aquarium Lights. So after a little digging on the Internet and even more digging around by asking friends in the industry, I found a revealing fact, and that is these two companies; EcoTech and Aqua Illuminations, often speak at and sponsor forum and club meetings. As well you have persons such as Sanjay Joshi heavily promoting these LED fixtures using his credentials as proof, yet ignoring the science of PUR & PWM while going over board on PAR readings produced by emitters producing high amounts of USELESS PUR light energy, while copious amounts of input energy is lost as heat due to the technology used to drive the emitters. Unfortunately I know of professionals with vastly more experience than this man [in one case 1978 versus 1992)], yet this person gets so much credibility? One reason I also suspect is catchy, cool photos that prove nothing. If someone produces great photos proving man never landed on the moon, would you believe this too [unfortunately this has been done too]. What does this mean? well for one I think the moderators and members lose most of their objectivity due to sponsorships and gullibility of reading pseudo scientific information as noted earlier. So when they read about a review that promotes the “wrong” LED and shows the short comings of EcoTech, Aqua Illuminations, and other LEDs, these persons resort to personal attacks. Admittedly I cannot prove my opinion as to the ‘why’ of these actions, but I ask anyone reading to otherwise explain why it is primarily forums/clubs that promote these two companies LEDs while trashing those who question them? So what are the known facts besides the observations made by me and so many others in my profession that show both these LEDs to be good LED fixtures, but not the best? Both the EcoTech and AI Sol do not attempt to use dozens of low output one watt (or less) emitters daisy chained together which further lowers the actual PUR output of each emitter. Rather both these fixtures go the route of quality CRee emitters tied together with excellent circuity. This is important as unlike other light types, the more emitters in a circuit the more complex the drivers must be to keep very exact voltage for optimum useful energy output. This is a problem with the Sky LED. See my post about these LEDs: TaoTronics, SkyLED, Skkye Marine, LED Light Reviews. However this is where the EcoTech MAY have a couple negatives; as I understand that when you have controls to vary RGB output, this results in less than optimal PUR light output. I have to admit that I do not know for a fact that this is a problem, although this makes sense as an LED is not a bulb, rather a light emitting diode, and even small changes of voltage can therefore affect spectrum. But what I do know is that I would rather have a factory set LED fixture where by the emitter output is EXACTLY what my reef inhabitants need without wasted green emitters to make a ‘pretty green color’ should I choose. I would also note that it would be easy for me or a client to inadvertently change the RGB setting to a less than desirable nanometer output. For me, I have to agree with other blog reviews that this is not a desirable feature of the EcoTech Radion, but I would also state from my use that this is not a “game ender” either. 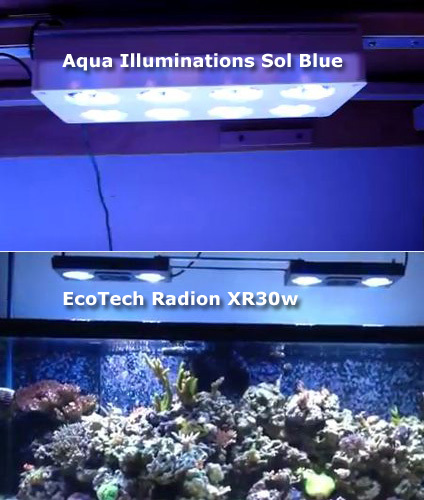 The other negative for the EcoTech Radion XR30, Radion Pro, & Aqua Illuminations is the need for a cooling fan that the AquaRay, and other high end LEDs that utilize the vastly superior PWM* technology do not require. From my discussions with others who know more about electronics than me, this indicates more heat producing voltage spikes are being allowed in the emitter drivers. These same voltage spikes also degrade essential PUR/Useful Light energy output and wastes energy that would otherwise go into lighting your aquarium. 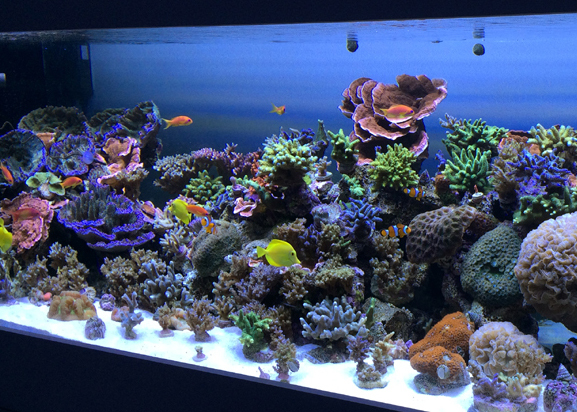 In fact wasted energy as heat is probably my biggest complaint with either fixture and in fact is one of the more provable facts against these two LED fixtures, as it does not take much more than a 5th grade education to realize that ANY energy that is going to heat is NOT going to light your reef aquarium! While definitely an improvement on earlier AI LED models, the facts are that the standard binned Cree XT-E Cool White LED emitters used by AI are inferior when it comes to important PUR light production. As well the use of UVA 400nm emitters is questionable, as at this time there is no science based evidence that this is a beneficial light wave length when it comes to PUR required by corals and in fact possibly burn corals. As noted in another LED Review Website, that was attacked by the Trolls of one of the forums I referred to, the mixture of blues is the biggest selling point of the EcoTech Radion. The emitters used compliment each other very well in this LED fixture. Now the down side: While the EcoTech attempts to get around the use of Cool White emitters by boosting output, the fact remains that cool white is even worse than the use of 6500K emitters for a reef aquarium. You couple this with the totally useless green emitters and you have a lopsided PUR heavily favoring some excellent blue PAR, but more useless green than is necessary, which also comes from the cool white emitters. On one positive note, the red emitters do salvage the PUR spectrograph, so this results in at least a reasonably capable Reef LED with some wasted green light energy. Another interesting point about the EcoTech Radion, is that its emitter color mix is similar the TMC AquaRay Color Max. The Color Max uses Uses 4 Daylight Cree XP-G (9000K); and 2 green, 2 red, and 2 blue Cree XP-E Power LED emitters. This is where I have noticed attacks getting personal in some forum posts I was forwarded. My guess is since they either cannot grasp this FACT of business or do not want to deal with it, they attack the “messenger” of these facts. It is not rocket science that most businesses have development costs and when these business have new patent on either an existing product update or an entirely new product, they are to sell these to the highest bidder or those companies that have contracts for newest patents. Where am I going with this? Well it is quite well established in the industry that TMC has patent rights for the newest Osram Olson & Cree emitters. The result is the XT-E emitters used by EcoTech or AI Sol is NOT the same emitter used by TMC. The result? This also is not rocket science and that is the XR, XT and XP emitters used by EcoTech and Aqua Illuminations are certainly good and capable emitters, they simply ARE NOT the best available as these are simply the over the counter emitters ANYONE can purchase. No different than an earlier generation electronic devise may work quite well, but is not as capable as the newest generation. This difference usually results in a less efficient emitter, lower spectral quality, or both. Both the EcoTech and Aqua Illuminations are only warranted for a year, not a lot for an expensive electronic device, especially when others have up to 5 year warranties! And finally, yes I too have a Bias; I am biased toward products that work BEST and have known facts to back them up!